Recently I was given the opportunity to preview an upcoming new game that is currently available to back on Kickstarter. I received a print and play copy of the game and rules. These are my thoughts and opinions on the presented materials. Enjoy! 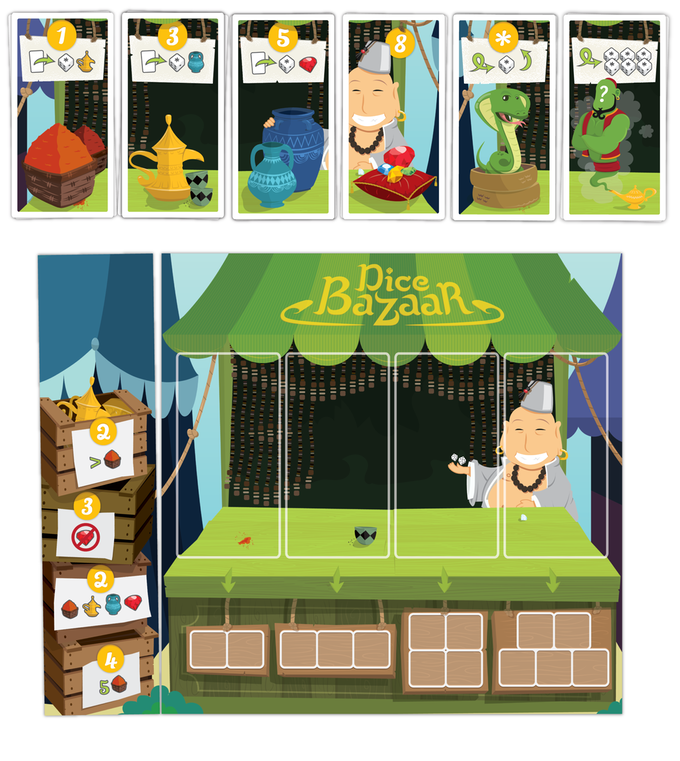 Dice Bazaar is a game by Fedor Sosnin, published by Disruptive Inc. It is for 2-4 players. In this game, players will be competing against each other to buy and trade for the most valuable products in the bazaar. The player that can collect the most valuable items will be declared the winner. To begin, the board is placed in the middle of the play area. Four decks are created, one for each of the four products; spice, tea pots, pottery and gems. Each deck will have 3 of the appropriate cards for each player, except for the gems which have 2 per player. One cobra card is also shuffled into each of the 4 decks. The rest of the cards are placed back in the box, not to be used. Each of the product decks are placed face up on the board from let to right in ascending order from 1-8. If a cobra card is visible on the top of one of the decks, it is reshuffled until a product card is visible instead. The white price dice are rolled and randomly placed in the white squares under the products on the board. This will result in 2 under the spice, 3 under the tea pots, 4 under the pottery and 5 under the gems. The dice sets should be arranged from smallest to largest under each product card. Each player chooses a color and takes the corresponding 6 colored dice. The first player is chosen and play now begins. On a player’s turn, they will start off by rolling all of their player dice. They will then try to match the dice they rolled with the price dice under the different products. They will then purchase product cards on any price dice that fully match the player’s dice. The player shows this by placing their dice under the board of that product. The product card is then taken by the player and placed in front of them. They will then move the dice that they used to purchase with off to the side, as these can’t be used again on that particular turn. Once a product card is removed due to matching the price dice with the player dice, the player must then re-roll the price dice for the new product card. If any dice have been set aside by any players and they no longer match any of the price dice, they are removed and returned to their owners. Speaking of setting aside dice, after rolling their dice, a player is allowed to set aside any unused dice under the board as long as they match the current price dice under the product card. This allows the player to basically lock in some of the dice needed to fulfill the cost of a certain product, even though they might not have rolled all they needed to complete the cost. Of course, on their next turn the player is only able to roll the dice that have not been set aside. It should be noted though that a player is allowed to remove all their dice under any product card. However they have to remove all their dice and can’t remove just one or two. It’s all or nothing. The player is also allowed to trade. Trading may be done at any time during a player’s turn. The player can trade any eligible product cards by using the symbols on the top of the card. The player then discards the traded card face down beside the board. The player then chooses a unused die and rotates it to the desired number. Once the player either can no longer or chooses not to perform any of the previously mentioned actions, their turn is over and play passes to the next player. The game continues until two products are completely sold out and there are no more product cards left in the stall of that kind. Players then add up their score by adding the points listed on the top of each product card. If any cobra cards were purchased by a player, they then roll a die to see how many points the card is worth, adding it to their total. The player that has the most points is the winner. Since all that I had available to me was the print and play files for the cards, I won’t go into too great of detail here. What I will say is that the artwork for the cards is really appealing and full of bright colors that will really catch your eye. I really like the look and design of the game. I can’t really speak on the quality of the components other than that from the way everything looks laid out on the Kickstarter page, they all appear to be of good quality. As I said, I really like the design of the game and the fun art style. This should end up being really cool. The rulebook was also a print and play copy so I can only tell you how it looks prior to release. The book has lots of pictures throughout the book. The rulebook has that same whimsical style that the cards and board do. All the components are highlighted in a full color spread. All the rules are easy to read and understand. It will not take but a few minutes to read through the book and you’ll be ready to play. I really like that aspect of the rules. The only thing that concerned me was there were no rules explaining how to use the Collection expansion, thus it was left out from my review as I didn’t understand exactly how to use it. I’m sure this will be rectified before the game arrives to backers, so there’s no need to worry. In any event, everything looks really nice and should be a nice compliment to the game. This is a really fun little filler game that is really easy to play. If you can roll dice, then you can play this game. That said, players that don’t like dice rolling games need not apply. I like the simplicity of the game but I also like that there is at least a little more to the game then simply rolling dice. The fact that you can trade off lower priced product cards to help you get those higher priced product cards is pretty cool. Fans of dice games like Roll For It should really enjoy this one as it adds a little bit more to the mechanic in that game. This is a really light and fun game that the whole family can enjoy. As I said earlier, it’s super simple and it plays really quick. Most game sessions last no longer than 30 minutes. That makes it great as a warm up for some heavier gaming. I really enjoyed it. 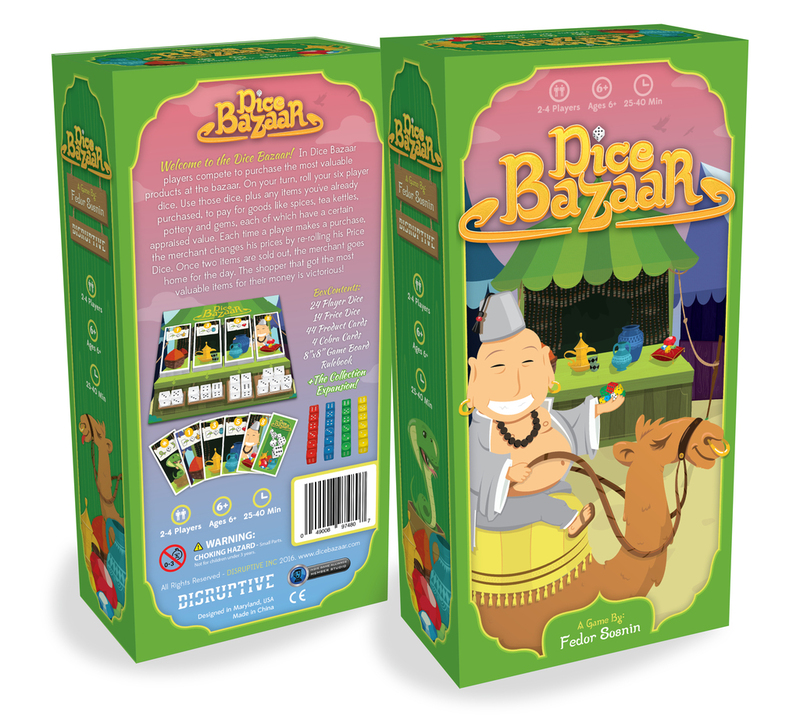 Dice Bazaar is a really light weight game of dice rolling for the whole family. It plays really quickly with most games lasting no more than 30 minutes. The artwork is very cute and whimsical and should appeal to kids as well as adults. Fans of games like Roll For It should find the dice rolling mechanic improved on a bit in this one. Everything looks well thought out and the finished product should be top notch from everything that I’ve seen. This will be a great little filler game that players of all ages should enjoy. I would recommend it. It’s a great addition to any family library. For more games from this company you can check out their website below. You can find more information about this game and back it on Kickstarter now by following the link below. This entry was posted in Preview Reviews and tagged bazaar, board, board games, card, card games, dice, dice bazaar, disruptive, disruptive inc, fedor, fedor sosnin, games, inc, sosnin. Bookmark the permalink.